Holding years of expertise in the industry, we, as a Manufacturer, Exporter & Supplier, offer Semi Automatic Tube Filling & Sealing Machine. We manufacture the best quality thanks to our skilled professionals, sophisticated technology and latest machines. It is suitable for different applications across various industries. The raw material used in manufacturing process is procured from reliable vendors who refuse to compromise with quality. The supreme quality makes the machine popular among customers. 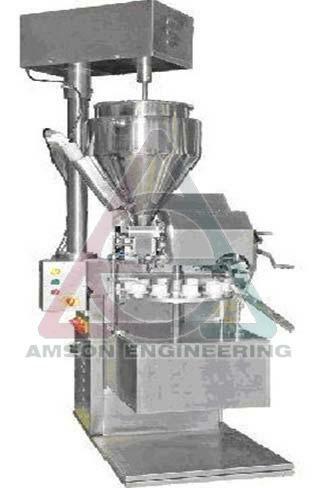 d simple to operate design from AMSON Engineering, by which you can fill, seal, stamp Batch Code and trim around 3000 sealed tubes in 8 hour shift. AEPFSCT15 is suitable for Cosmetic and Pharma industries where the daily production is medium. This model can be also used for lab and R&D purpose because each time a single tube is sealed or trimmed. The Machine occupies a small area of floor space ( 2 ft X 2 ft). Peculiarity of this design is all operations are done pneumatically. There are switches for semi-Auto and Manual selection. Each operation can be individually selected by electrical Push buttons. Inbuilt Panel box at the front side, having Main operating switches and controls like Mains ON-OFF, Digital timers, Digital Temperature control are given. All Timers for Filling, Heating, Sealing, Trimming are fitted at the front operating side to select the time and temperature easily according to the tube characteristics. A separate chamber at the back bottom side of the Machine hold the pneumatic controls such as electrically operated solenoid valves and manifolds flow control valves etc. Any tube diameter from 16 mm to 50 mm can be Filled , sealed and trimmed in this model. Tube diameter changes but holder outside diameter same. This helps in holding any sized tubes in location without changing centre. Easy adjustment of Filling sealing station height according to different tube heights by rotation hand wheels. Any tube heights from 60 mm to 230mm can be sealed and trimmed. 1 pair of different tube holders supplied with the machine. All types of tubes can be sealed whether it is plastic or Laminated/ LD/Monolayer/Multi Layer etc which have plastic inner lining. Adjustable digital temperature controller to select different temperatures for different materials of tubes. In-House Manufactured Stainless steel Hot Air Gun with high efficiency. Adjustable heating time and sealing time for different tubes. Solenoid operated trimming and batch coding station and can be operated by push button. Separate air pressure regulator for the machine to maintain air pressure steady. Flow control valve to maintain hot air flow to the tube ends. Compact and economy model requires small area to occupy. 2 complete sets of batch codes- Numerical letter- 0-9 supplied with the machine. Hard chrome plated Sealing teeth with specially designed batch code holder. Product hopper stainless steel 304 quality standard size of 10 liters provided. Packing size: 2Ft Length X 2 Ft Width X 5 Ft Height. Gross weight including packing: 150 Kgs. Electricity Required: 4.5KwH, 220VAC, Single Phase, 50 Hz, Or as per customer requirement. Complete Stainless Steel Hot air assembly. Sealing type: Hot air assisted Pneumatically operated sealing jaws. Tube length: 60mm to 230mm. Sealing: Vertical texture, 5-7mm width possible. Number of Batch codes inserted in sealing teeth: 10 Nos. or as per required. Both Side Batch coding possible on request. Machine type: Semi-automatic tube Filling sealing, coding, and trimming machine, Standard MODEL with stainless steel frame fabricated and finished to Mat, and all other non-contact parts are made in carbon steel finished and chrome plated quality..
All moving parts, machine frame covered by SS sheet metal of good gauge and finish. Panel box inbuilt carrying timers, Temperature controllers and operating switches.